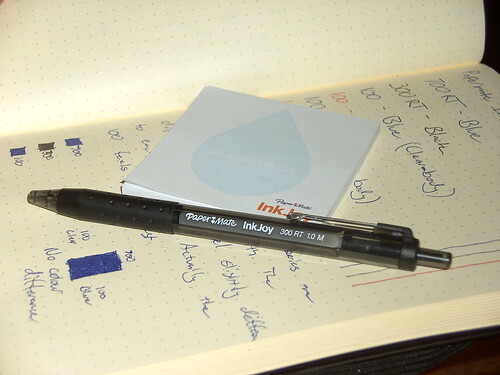 I was recently contacted by Claire, who offered me some Papermate Inkjoy pens to try. They are a reasonably new product from Papermate which are designed to be a lot smoother to write with than your standard ballpoint. In the package I was sent, there were 7 different pens, all from the Inkjoy range. Five of them were the basic Inkjoy 100 in quite vibrant colours, and there was also a 300 RT and a 700 RT. The 100′s are a fairly standard, hexagonal-body ballpoint that comes in various colours. The 500 RT is a retractable version with a rubber grip and round black body, and the 700 RT is (according to the Press Release) modelled after a Grand Piano. All the pens write extremely well for Ballpoints. Personally, I don’t opt for a ballpoint if I had to choose, but these Inkjoys blur the line between ballpoint and a rollerball. They are almost too smooth. One thing I did notice was that the 100′s were actually the smoothest. This was confirmed by some workmates who gave the pens a try. Another interesting note is the line width. While all the pens are stamped as “1.0″, which I assume means they are a 1mm pen, they put out a very thin line for such a wide ball. I prefer 0.5mm or even thinner lines, but these were quite acceptable. In the mix of pens there were 3 which were blue. Two of them were 100s, one with a blue body, and one clear, and the 700 was also blue. I was interested to see if they had different colour blues or not, so I did the following test. From what I could see, they were all the same. If I had to pick a favorite pen, I would look at the 300 before the 700. For one, it’s black (I’m not sure if you can get the 700 in black) and I always use black pens. I also find the grip to be a little softer and easier to hold. That isn’t to say that the 700 is not a fine looking writing instrument. It is also a fair bit more expensive. Inside, the 500 and 700 are not the same, the 700′s ink cartridge is longer than the 500′s, and a different spring is used. I guess that rules out swapping the black into the 700. The RRP supplied with the pens puts the 100 at about 40c each, when buying in a multipack, the 300RT around the $1 mark, and the 700RT at about $2. Obviously, RRP and vendor prices will differ, and you won’t always buy a pen in a pack of 8, but it’s a good estimate. To wrap up, I do quite like these, and would recommend anyone who uses ballpoints a lot to give them a go. Maybe buy a 100 if you see one, and if you like it, think about picking up some 300′s or 700′s as your every-day pen? So I was at walmart shopping for pens and picked the 500 inkjoy pens and I was like what are the numbers for? So I just googled it and this REALLY did help me! THANK YOU! I saw the commercial for this pen, and when I was at walmart saw it at the store so I thought I would pick one up. Although it writes really smooth it leaks ink everywhere! next generation of pen should fix this problem. I just bought the 700 1.0 and I have ink all over my fingers and on the paperwork I was dealing with. Hope it’s just a bad pen but I have my doubts. Sorry to hear about that. Do you know what happened? I guess with mass-produced items quality can’t always be guaranteed. Like others, I was trying to determine the difference among the numbers–100, 500, 700 to order some pens online. This was very helpful–thanks! Do they seem lefty friendly? I need pens that dry quickly and don’t smear. My favorites are the Pilot P-700 and the Uniball Jetstream. Unfortunately I don’t think they are. I just had a bit of a write with one of the 100′s (in blue) and it smeared quite a bit, even after about 30 seconds. I believe that making the pens “smoother” means a little more ink on the page, and a smoother ink in the barrel. That would probably lead to “smudginess”. Just got a ten pack of the 100s … love love love! Really glad you are enjoying them! Do inkjoy come n purple? Yeah, they do. I think there is about 10 colours available. Bought a pack of two 700 pens. Neither works. Is there supposed to be a blob of whitish stuff on the point when these are new? I thought maybe it was a wax protectant, but no matter what I do to get the thing scribbling, nothing happens. Picked off the white stuff on one, but makes no difference – neither will write. Margaret- it is a wax seal, once you pick it off the pen should work. I’m finishing up university and I just bought a pack of 700 pens to hopefully inspire my studying. While they do write smoothly, I was really disappointed with the amount of ink that got all over my fingers. The pens do seem to “bleed” a little. Love the look of them but next I will try the 100 or 500s.. hopefully they will leak smudge/leak less. Same here! Right out of the package mine was already broken! It is disappointing for sure! Hi, iam looking to buy the paper mate 100 1.0mm blue body, and the 300 1.0. however i cant find a Canadian online store that sells these and all the shops around my area dont have them. plus i dont have time to go to a Walmart or something. so if anybody has any idea where to get them, please help me out. I bought Ink Joy 100 for the office. We use primarily blue ink and the feedback was terrible. They leak, smear, you’ll end up wearing as much ink as you write. Switching back to Papermate Comfortmate pens. Same here, my thoughts exactly! I bought the 700s and also a multi pack of the 300s with the metal clasp that is retractable. I am very disappointed because right out of the package the green was broken and ink was all over the inside of it. My coworkers also had the same experience with some of the InkJoy pens. They write so nicely but it is very disappointing that they break so easily apparently. I bought the 300 RT, multi color Ink Joy pens. I have never had them leak or had any problems with them. They write smooth. I like more drag in my pens honestly, but there are great pens regardless. Not my favorite, but they work. I bought a four pack of black ink 700rt 1.0m, and they were amazing. No breaks no leaks. I think it’s my new favorite. or writing personal checks with these pens. I was given 100RT 1.0 M in my office and they are really impressive.I am looking for more models of this type. These pens are awful. I bought a pack of the black Inkjoy 700RT 1.0 M…The ink dries up at the end and forms a ball almost like a glue. Hard to get started writing. Worst pens I’ve ever owned. 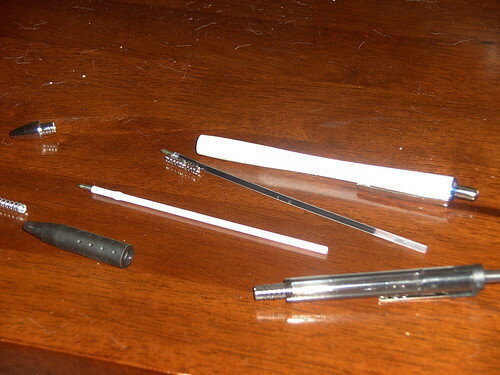 I have the 700′s because I needed a 1.0mm pen for writing essays. My favorites are probably the profiles, but they were too thick for what my teacher required (1.4mm) I LOVE THEM! They don’t seem to smear of leak like everyone else says and I have been using them for about 6 months! they write really smooth and are perfect for my needs! I don’t get why everyone else seems to hate them?!?! 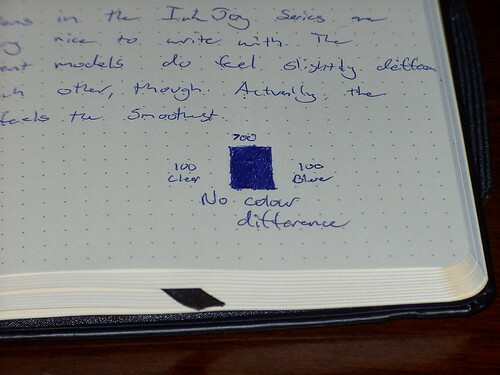 The blue Ink Joy 100 1.0 m randomly appeared in the office, and it’s eveyone loves it! It the best pen I have used thus far in my life. Excellent review and right on. These pens are really great. I prefer the fine point of the 100s. Ten bought for new term for 2 sons.No.1 son shirt destroyed, pen leaked after one week in the school blazer, No.2 left handed son complaining that he can’t use them because of smudging. All pens put in bin. As a writer I’m really fussy about the pens I use. Previously I lived by the Profile, which I used in black and purple. I’m out of my stockpile and as I tried replacing them I found they were almost impossible to find. Was really hoping the InkJoy would be Papermate’s new answer. I tried the 100. It ran out of ink within 5 pages of notes. Papermate, bring back the Profile! Everything you claim to be an “Improved” feature in the InkJoy was already present in the Profile! I’ve tried all the different Ink Joy pens. The only ones that didn’t smudge for me were the 100s. I still love them all. When pens don’t write smoothly, it really irks me, so these pens are a delight to use! Given the Paper Mate name and the price, I was expecting a lot of these 700 RT InkJoy pens. Instead, all four that I’ve tried leak, blotch, and smear. I’m old enough to remember the awful smears ball point pens made when they first appeared in the 1940′s. Are we going back to our roots?? 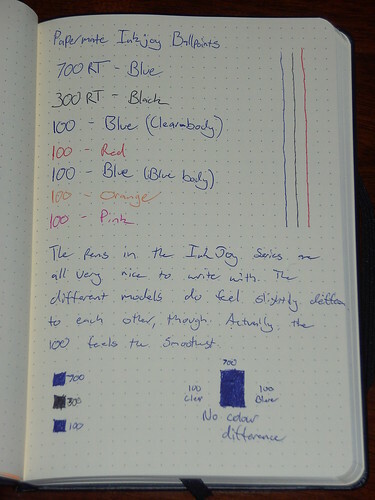 Just spent the weekend trying to remove blue ink stain leak from PaperMate InkJoy 300RT 1.0M on my partner’s best white shirt; limited success so far but the shirt is worth the effort. The pen is in the rubbish bin!!! It’s weird that so many people have had problems with getting ink on their fingers. I’ve been using these Ink Joy pens for a couple years now and I absolutely love them. A couple can leave a blotch here and there but not too bad. I’ve had all the numbers except for the 100. I like the professional look and feel of the 700RT but each one is nice. The only other pen other than these I use is the profile elite but that one is 1.4mm which is a tad think sometimes. I have a solution. Since I like the feel of the 700RT I bought a pack of the Foray Size It refills and cut one to fit. The ink is true ballpoint but no blobs. 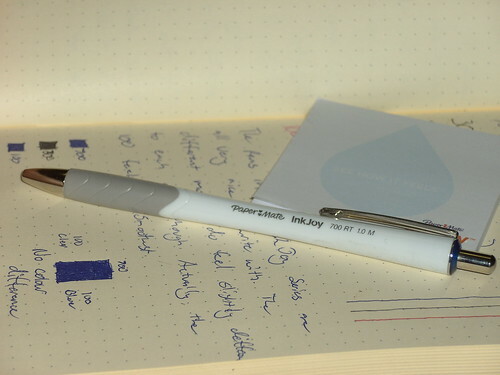 If you have already purchased an Ink Joy it is a cheap way to keep the pen. I have been trying InkJoy 100. They are absolute rubbish. They start out writing ok, but then the lines start to fade, and the ink dries out in the tip. Sometimes I can get them going again but I certainly wouldn’t say there is anything joyful or effortless about this product (claims made by the manufacturer). Eventually they stop writing altogether, even though I can see through the clear barrel that there is plenty of ink remaining. Don’t waste your money on these – the quality is very poor. I borrowed a fellow worker’s pen last week. I was so impressed with the comfort of the barrell and the smoothness in which it wrote, that I made note of what type it was so that I can buy some for myself. It was inkjoy 100 RT 1.0 with black ink. I am online now trying to find out where I can purchase them. Love this pen! I am in love with Papermate Inkjoy 550RT 1.0, I have not had any problems with smearing or extra ink…smooth writing and love the deep color. I know I’m coming late to the party but I wanted to comment. They must have fixed the leaking issue because I purchase these for my business that employs around 70 people. Everyone loves them and I have heard no complaints of leakage. The ones that I normally purchase are the 300RT 1.0M with the translucent barrel. Typically we have the blue, red, and black. I too found your page because I was wondering what the number stood for. My grandfather was a lifelong pen collector and I was really missing the ability to simply ask him. Thank you for standing-in on his role and answering the question for me. 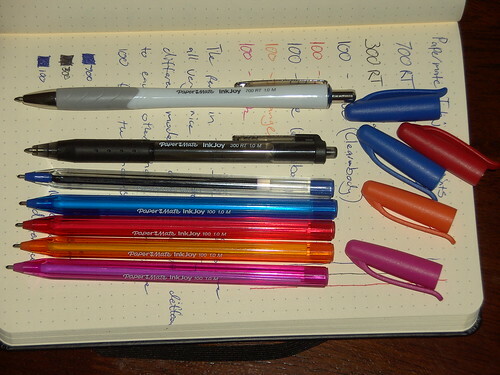 I’m very picky about the pens I use…all these are great as far as comfort goes, but I don’t like to write ‘hard’ (bearing down hard)…I want a pen that the ink is very BOLD without bearing down. I have a Foray advanced ink ball point pen that is working okay right now, but it tends to have ink blots and I hate that!! Do you have any suggestions…? Thank you share your post for Papermate Inkjoy Ball pen 1.0 purpose. I also have 700RT pen which have nice and sharp nib and also smoothest and also comfortable for writing . Any person can buy this pen. Actually pretty bad pens, they start off writing so smoothly but everyone that I have had becomes very inconsistent after a few hours of use. Cannot write with them as they become quite temperamental and stop putting ink on the page whenever they feel like it. Papermate Inkjoy Ball pen is a nice pen for writing purpose. This pen literally does what the Pilot Acroball already does, but much worse. I have NEVER had my Acroballs smudge, blotch, or do any of the things these Inkjoys do. frequent updates will give your site higher rank & authority in google.